Shrub willow has been breed as an energy crop in Europe since the early 1970’s with the goal of producing bioenergy crops that are fast-growing, high-yielding, genetically diverse, pest and disease resistant, and able to grow on marginal land without competing with food crops. Breeding shrub willow entails traditional breeding techniques. Willow is dioecious, with male and female flowers on different plants of the same species. Pollen from male flowers is extracted and can be stored for an indefinite time period at -20°C. Female flowers are forced in a greenhouse and hand-pollinated using the pollen extracted from male flowers. Seeds develop in the ovaries of the female flowers and mature approximately 3-4 weeks after pollination. This controlled pollination technique allows us to chose parents that display specific traits of interest regardless of flowering time and perform crosses that may occur only infrequently in nature . The New York State willow breeding program began in 1996 at SUNY-ESF using accessions obtained from Europe. Unfortunately, these species proved to be highly susceptible to damage from potato leaf hopper and deemed impractical for use in a NYS breeding program. As an alternative approach, native and naturalized species of willow were collected from NY, NJ, PA, OH, RI, CT, MA, VT, NH, MI, MN, IA, WI, IL, MO, IN, KY, WV, and CO to generate a breeding population specific to North America. 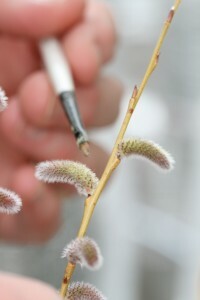 Native species of willow, such as S. eriocephala, S. discolor, and S. bebbiana and their hybrids, as well as non-natives such as S. miyabeana and S. sachalinensis were also obtained from Dr. Lou Zuffa at the University of Toronto, Canada and Dr. Pan at the Jiangsu Forestry Academy, China. Starting in 1998, controlled pollinations were performed using parents screened for a multitude of traits including pest and pathogen resistance, growth form and shape, and high biomass production. The top individuals from the best families were further screened in a more rigorous fashion using a randomly replicated experimental design. Larger, regional trials have also been established using individuals producing the greatest yield from the selection trials. Since 2005, trials have been established in the US (NY, PA, CT, MN, MI, MO, VA, and IN), Canada (AB, MTL, and PEI) and Northern Ireland with the varieties generated in the NYS breeding program. Seven varieties have been patented and are now in commercial production. All of these individuals, as well as some of their parents, are separated into genetic diversity groups and can be obtained through Double A Willow, a willow nursery located in Fredonia, NY. In 2005, after a three-year lapse in breeding at SUNY-ESF, new families were generated using naturalized and non-native, pest and disease resistant parents as breeding stock. Similar selection occurred and now the top individuals from this round of breeding are also in yield trials undergoing intense study and selection. In 2009, the NYS willow breeding program, under the direction of Dr. Larry Smart since 1996, moved to Cornell University, NY State Agricultural Station, Horticulture Section in the School of Integrative Plant Sciences. Over this 15-year period, we have continuously and dramatically improved the yield of our best varieties. The finest varieties from Canada were producing yields in the range of 6-8 wet tons per acre per year. Today, our patented varieties are producing yields in the range of 8-12 wet tons per acre per year. We have also produced progeny that are more resistant to pests and diseases than their parents or species native to North America. While the traditional breeding program will continue at Cornell, new tools are being developed to improve the NYS breeding program and attain the goal of producing a suite of high yielding, genetically diverse, varieties of shrub willow that can be grown on marginal land. The use of genomics will allow us to screen parents and progeny for specific genes and gene families that influence such traits as wood composition, water use efficiency, pest resistance and disease susceptibility.